Important – It happens on the last weekend in the month – Friday and Saturday, 5.00pm to 11.00pm. We always meant to eat at the monthly Night Market since it started last year but we either forget it was on until after we have eaten, or the rain and cold has kept us away. But this time we remembered on the Friday … the rain looked likely but it only came in short bursts and sheer hunger made us more courageous. We went again on the Saturday, when the weather was better, and across the weekend we managed to eat or drink at five establishments. The stalls cover most types of food and countries. Spain, Pakistan, India, Jamaica, USA, Italy, South America … but the food isn’t always what you would expect to find. 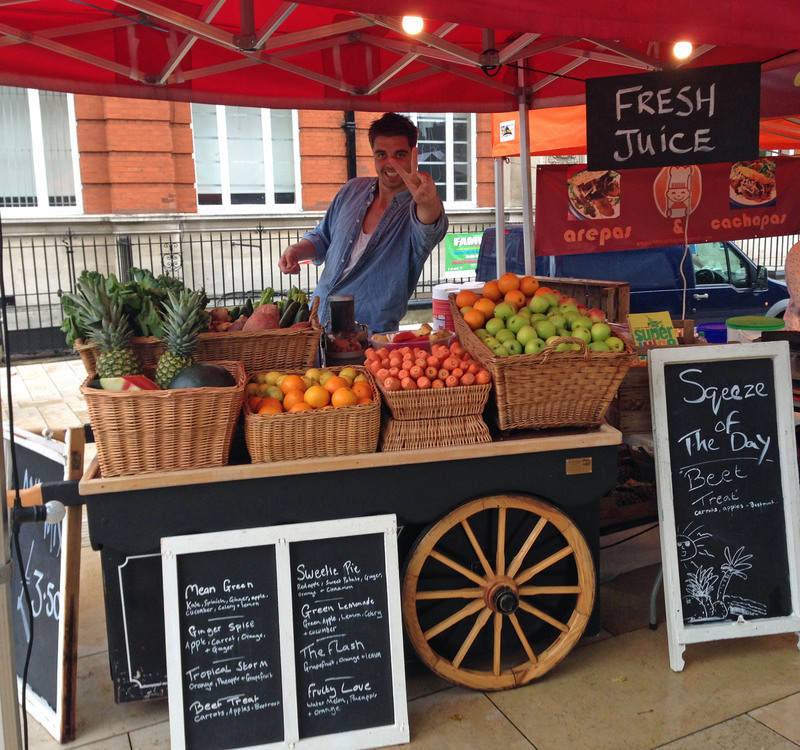 First you hit the juice stall (only there on the Friday) and the very helpful assistant takes you through the options and, even when that choice is made, he guided me on how much each ingredient I would prefer. I chose sweetie pie (sweet potato, apple, ginger) a thick delicious orange juice which wasn’t too sweet and was very gingery – you are allowed to add more or less depending on your taste buds. However, it is filling and if you want to feel really healthy at the end of your street meal then leave this until afterwards – as dessert. The gluten free meal from the Venezuelan Arepas and Cachapas uses sweetcorn pancakes filled with pulled pork, beef or Cajun chicken. Mine was beef with garnishes of plantain, coleslaw, hot sauce. My preference is for less meat but I know that isn’t everyone’s taste. This was really piled high and I couldn’t eat it all … next time I’ll get half. I asked for the hot sauce to be put on one end so I could taste the other parts before having a blast of chilli. The sweetcorn – given its name obvious really – was sweet and tasted of corn … unsurprising but it could so easily have just tasted of cornmeal flour, so this was a bonus. The next flavours are again sweet – plantain and I was very glad of the hot sauce which was a little fiery but also really full of flavour and cut the sweetness of the rest of the dish. On to the Cheeky Indian (best name ever) where we chose a Bheijing Bhuri – pulled lamb, on red leaves with cucumber and spring onions drizzled with homemade plum sauce and served in lavaash flatbread ….and after that explanation how can you fail not to buy. They also had equally intriguing Frikkie Tikki with minted mayonnaise and a Goan beach burger. To wash it down they also serve some delicious ginger lemonade. Paella from Yum Yum Paella – Don’t try to get it before 6.30pm as they only start cooking at 5.00pm. It does mean that’s all fresh and an interesting sight as they push the food around the large flat pans. It is very colourful (bright yellow from saffron) and full of mussels, squid and chicken, but was a bit too salty for my taste and not as good as one of our own. But we got the first batch when it had only just been cooked and I am pretty certain that it requires a bit more time. Then on to the Philippino stall – Pinoy’s Kitchen – where we had Adoba chicken and rice advertised as the Philippines’ national dish. I expected the chicken to be spicy as some recipes have chilli but it wasn’t – presumably the Spanish influence. It is effectively marinated chicken (usually) cooked in soy and vinegar. It really fell off the bone and is easy to eat with a spoon which is a bonus when you discover that every resting place has someone leaning or sitting in it. 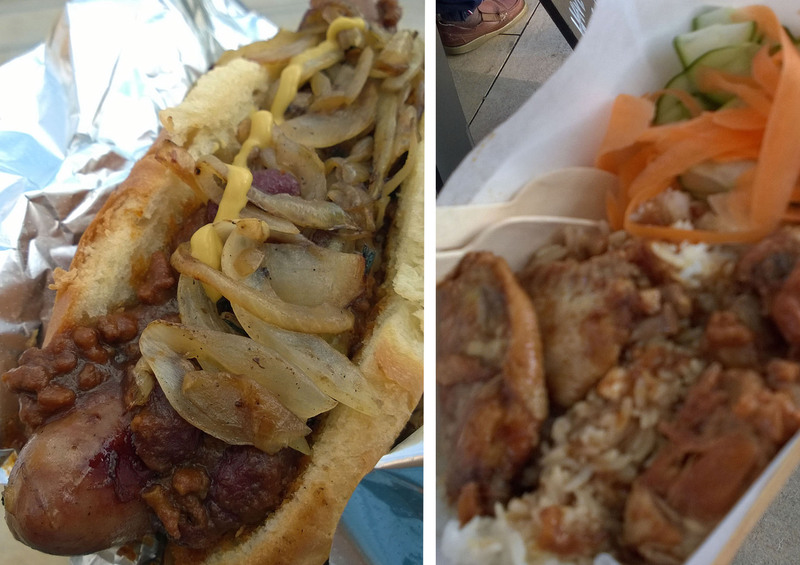 After that we had a chilli dog, which was a very large frankfurter like sausage in a long bun with the usual – fried onions, mustard, and tomato ketchup. It was what it said on the tin … a chili hot dog … lots of meat and just writing this means I am hankering after another. There were many other stalls but we were not up to the challenge of trying them all. There was pizza – slices mostly. There were pastrami sandwiches (boasting that they were the best this side of New York City but prepared on cherry wood somewhere close by). Local sourcing was a theme with a conundrum we never solved – locally sourced free range beef from The Free Ranger – perhaps you spotted them on Myatts Fields. 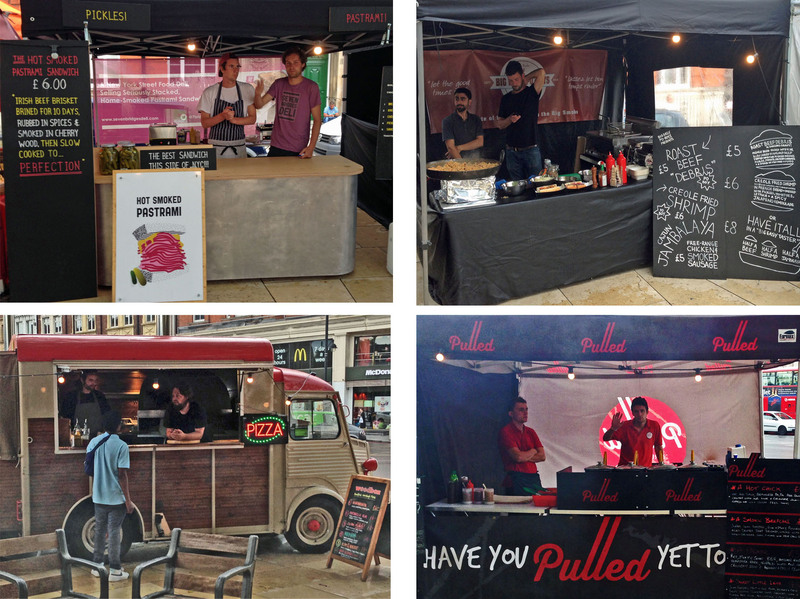 “Pulled” follows the meat theme and provides pulled peri peri free range (of course) chicken or beef, pork or lamb. There were the PoBoys … with Cajun themed food and finally, we think, there was jerk chicken. We were beginning to feel that vegetarians would have a really hard time. But there were also sweets and desserts with a cup cake stall and the Baker Boys from Brixton Prison. 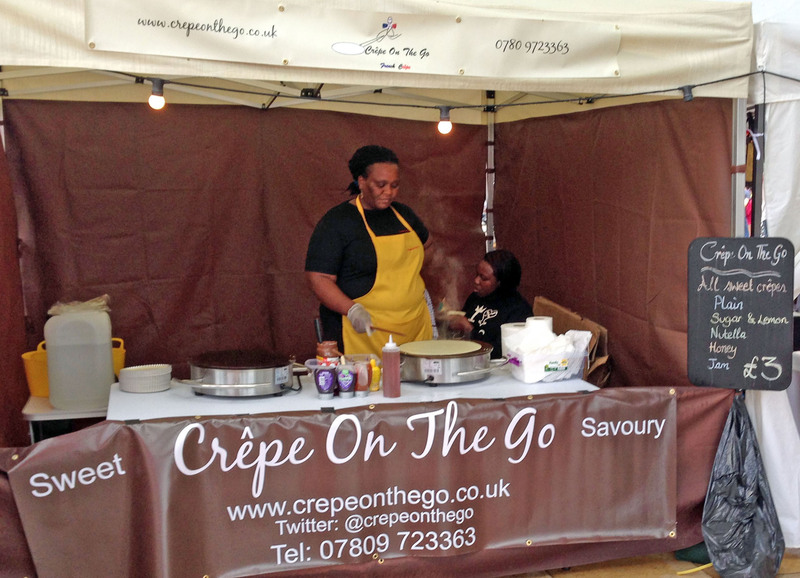 I just had space for a crepe from Crepe on the Go – traditional with lemon and sugar but you could have had nutella, honey or plain. This is eaten with your hands and is piping hot so beware. The cost – most main items are £5.00 – £6.00 – so take change. The desserts are about £3.00. As you see there were lots to try but remember, this is street food so be prepared to sit anywhere you can and don’t buy too many things to juggle at any one time. There is music and sometimes dancing (if you are really brave) to the DJ who is experienced at weddings no less. So on the last weekend in the month do visit and, if there is time, you can go to the Black Cultural Archives (also with a café) beforehand, as this is open until 6.00pm.